There’s no denying now that summer is over. For a while there, even though we were back to school, the days were warm and bright, flip-flops and short sleeve shirts were still in rotation, and summer seemed just slightly out of grasp. Now, as we approach mid-October and the evenings are darker, the air has a chill and pumpkins line my front steps, I know that fall is here, with winter just around the corner. It’s been almost a year since I chose “Audacious” as my OLW for 2017. Today I am checking in on my One Little Word. Part of being “audacious” has been seeking out opportunities to grow as a teacher and recognizing when certain positions are not for me. For a while I thought that I would like to become a literacy or instructional coach, but I’ve come to realize I’m happiest when working with my own students each day. Down the line, who knows…but for now, there is so much for me to do and learn by being in the classroom. I’ve signed up to lead workshops on using digital tools to maximize student voice and enjoy the chance to collaborate with fellow teachers. I am looking for ways to grow and also share what I’ve learned and tried. I also cherish my role as co-director of the Long Island Writing Project, an organization that supports teachers and values writing. Being part of the Two Writing Teachers continues to be a professional dream come true and I’m grateful to be part of this community of educators who care so much about the teaching of writing. Sometimes I feel less than audacious, but push myself to write and publish here because I believe teachers voices matter. While I don’t have many answers and still have many questions, I’m glad to be part of the collegial conversation- sharing my experiences, ideas and struggles here with all of you. It’s time to start thinking and dreaming of the word that will shape 2018. 2016 was all about “happy” for me and this year was about fearlessly chasing my goals and being “audacious.” What will 2018 bring? The wheels are starting to spin! What was your OLW and how did it treat you so far this year? My word of the year as I call it has been impact. And I have seen a great deal of change this year from it. Your check-in has reminded me that I need to write about my one little word soon! You are such an important voice in the teaching, learning, literacy community! 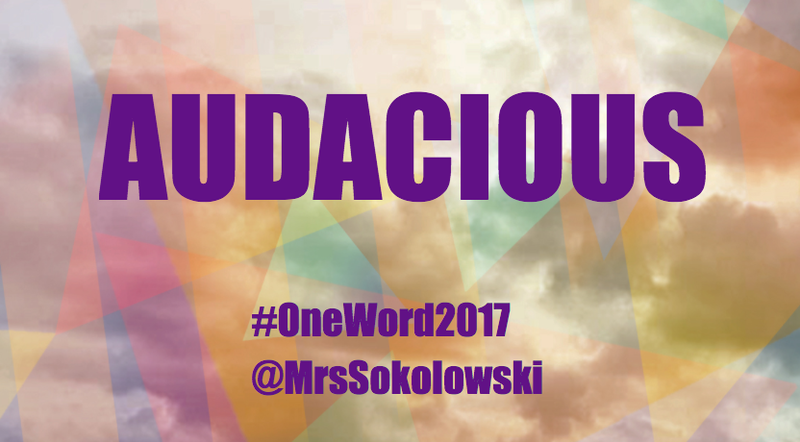 I love that your #OLW is audacious! I admire your fearless support of students first as evidenced by your priorities that always focus on students! I know the accumulation of your risks over the course of the year will tally up on the side of audacious at year’s end! Had a mini anxiety attack thinking of Christmas shopping Fran! Ha! But thank you so much for those words of support. I am so appreciative of what you said and all the support and friendship you offer in our different professional conversations. I learn so much from you. It was so wonderful to hear you speak in your “personal voice” today while sharing your thoughts with us. I remember your choice last year and thinking “good for you!” when you shared it with TWT. It was a step forward in confidence for you, one that you were truly ready for. You became one of my mentors about four or five years ago, and at age 70 I am still learning amazing things from you. I can’t wait to hear what next year’s word will be! Mine has been “cruising” as in PT Cruiser, and it’s held up well all year. I’m a bit reluctant to change it, in fact! Barbara! My friend! It is always good to “hear” your voice too. I love “cruising” and I am so happy for you that you are cruising along in so many ways. Honored by what you wrote and said. OLW – Developing – and it and I are still developing. I feel a bit like an old time piece of film in the dark room waiting for the image to develop. It takes time! I love “developing.” I bought a t-shirt last year that said “Highly Effective Means Always Developing”- a play on words for the Danielson Rubric and APPR (teacher evaluation). Developing is seen as a negative on that rubric but the truth is we are all developing and the best of us understand that and embrace it. I whole-heartedly agree that it takes time to develop.